Lakeside and Geneva understand that room service can be a challenge. The first challenge is keeping your food hot, fresh, and safe on the way to the guests' rooms. We have two options, including a solid fuel as well as electric hot food carrier. All are available with our room service tables and are also compatible with our competitors' if you have tables you're already happy with. The next challenge is space. We have our hot food carrier rack here that's going to hold 6 food hot food carriers in a small footprint in your kitchen to keep them out of the way and out of your mind. Another way that we battle space constraints is with our top configurations. We have many different options, including dual, triple, and quadruple fold to fit any kitchen. No space? No problem! Geneva's unique fold top design allows you to easily nest 6 tables where you could previously only store one, which brings us to our next challenge—linen. Linen is costly to store and to wash. It's labor intensive and time consuming. Our Duratop, which is available on all of our Geneva room service tables, can take linen completely out of the picture for you. It's a fully recycled black plastic material, which is going to elevate the room service experience and the guests won't even miss the linen. We understand that room service can be a challenge. 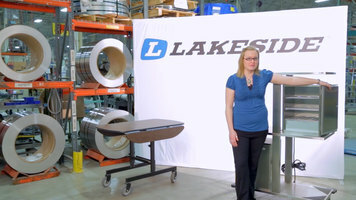 Let Lakeside and Geneva help you overcome those challenges today. Executing excellent room service can be a challenge, but Lakeside and Geneva make it easy with their line of hot food carriers and room service tables. Check out this video to learn more! For serving pre-assembled meal trays to patients, residents, or customers, there is no better or quieter choice than the Lakeside DCD-5510 stainless steel 10 tray meal delivery cart! Built with ledge panels that securely fasten to the frame to eliminate vibrations and wide treads on the casters for silent movement, this cart is one of the quietest in the industry. 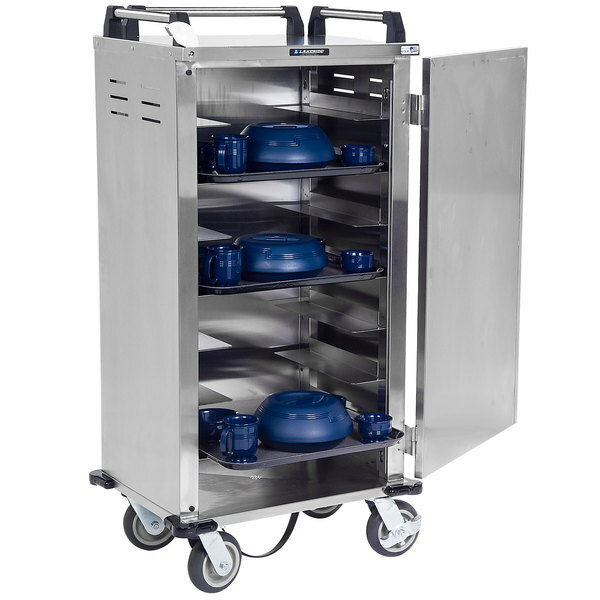 This cart allows you to easily deliver up to 10 meal trays to your customers in one trip. The ledges are spaced 5 7/8" apart to accommodate plate covers or beverage tumblers, and they will hold 14" x 18" or 15" x 20" meal trays. Plus, when it's time to clean this cart, the ledges come out so that you can be sure of thorough sanitation. When cleaning this cart, the channeled bottom directs any water or cleaning solution out through the drain. Also, its corrosion-resistant stainless steel construction makes it easy to clean and the door lifts off its hinges to get it out of the way during cleaning. Maneuvering this cart is a breeze since it comes with a built-in push handle and (4) 6" casters, two with brakes. Each of this cart's corners is equipped with a rubber bumper to protect walls and doorways. The top of the cabinet is also surrounded on three sides with rails to prevent used trays or other items from slipping.